Grief is a universal phenomenon. Possibly every minute, every hour even every day of the year, someone is grieving the loss of a loved one. It can be the death of a spouse, a daughter, a son, a sister or a brother,even a grandparent, or a friend no matter what the relationship, no matter how close or how distant, grief rears its ugly head with merciless, menacing pain and with piercing precision. Sooner or later,grief tears through the clutches of time and leaves the griever saddled with the deafening silence of losing a loved one to death. 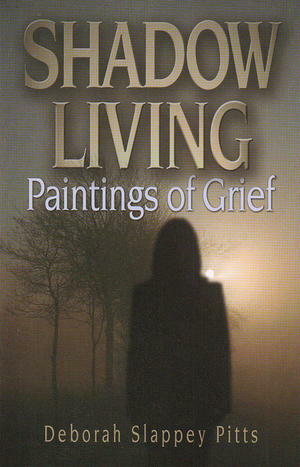 Shadow Living...Paintings of Grief continues where author, Deborah Slappey Pitts paused in her debut book, I Feel Okay (May 2005), where she superbly describes her family's desperate attempt to find a physician who would help her husband, the late Clyde Slappey find a cure for the menacing primary amyloidosis disease. Pitts and Clyde made it to the Mayo Clinic, their place of hope, but sadly, Clyde dies within two weeks of receiving a life-saving heart transplant. Now in the enthralling sequel to I Feel Okay, Shadow Living...Paintings of Grief,Pitts shares her intimate story of pain and despair as she reaches through the darkest crevices of her shadowy world of grief, holding onto God s unchanging hand. Pitts describes how she grapples between two worlds her new reality of living in a world without her husband and a faux reality where she tries desperately to hold onto precious memories as husband and wife. Pitts prays earnestly to God to bring herhusband back to her and the children. But deep inside, Pitts knows her husband won t be coming back. Out of the depths of her agonizing despair of becoming a widow at age 40, Pitts makes a heartfelt fight to live again in a new world without the sunshine of her life. Her story is very powerful in content. The reader is consumed into Pitts shadowy world of grieving and empathizes with her anguish and despair through every intricate word. Pitts story of survival is for survivors around the world and her story instantly connects with readers as they witness her brave fight with grief. Pitts describes grief as a super ficialentity that takes a life of its own through suffering and pain. She instantly connects with her reader, capturing their heart while she meticulously describes the perplexing stages of grieving that she experiences during her first year living as a widow. Pitts recounts her pain-filled days and nights of crying out in the darkness, praying anxiously for God to console and protect her and her children. With God as her refuge and strength, Pitts emerges from the shadows of grief to a life of renewed hope. Now her mission is to serve as a beacon of light and inspiration of hope and healing to others. It's a must read an unforgettable story; It s a must read an unforgettable story;written with candor, soul, and love.